We’ve grown fond of single-serve premium oatmeal cups. The grab-and-go packages are easy to tote, requiring only a half cup of hot water and three minutes of sitting time to turn into a nutritious breakfast or snack. The al dente oatmeal needs no milk, although occasionally we add some. Just add hot water. Photo courtesy Umpqua Oats. Three of the eight grab-and-go varieties. Photo courtesy Umpqua Oats. The benefit of Umpqua Oats over instant oatmeal is that the brand uses the whole hulled grain, rather than processed “instant” oats, providing more fiber in addition to better texture. There’s also less sugar than sweetened instant oats. The line is certified kosher by Blue Ribbon Kosher and certification by the Non-GMO Project. 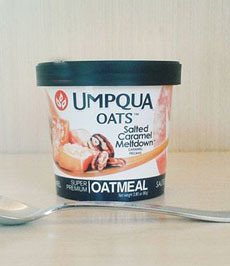 Umpqua Oats is currently sold at more than 2,000 retail outlets across the United States. 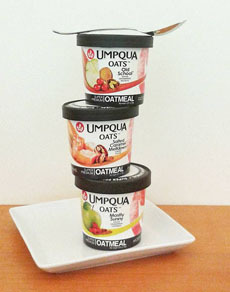 For more information or to order online, visit UmpquaOats.com. Founded in Oregon by two moms and now headquartered in Las Vegas, Umpqua Oats was one of the first purveyors to provide a quick-cooking, single-serve oatmeal product based on high-quality ingredients for taste and satiety. Umpqua is a river in southwest Oregon. The name means “thundering waters” or “across the waters” in the native Umpqua language.